What is the best way to apply CSS to elements in Shogun? 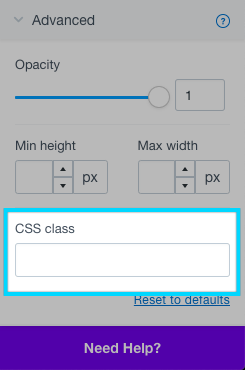 If you already have some css classes in your site's theme, you can use them in the css class box for a given element. You can also use HTML. If you already have some CSS classes in your site's theme, you can use them in the CSS class field to apply those styles to Shogun elements. Just enter the class name as it would appear in the HTML, e.g., btn-large . You don't need include a leading dot in this field. Tip: You can create a Snippet of frequently used CSS customizations to quickly re-use them on other pages.